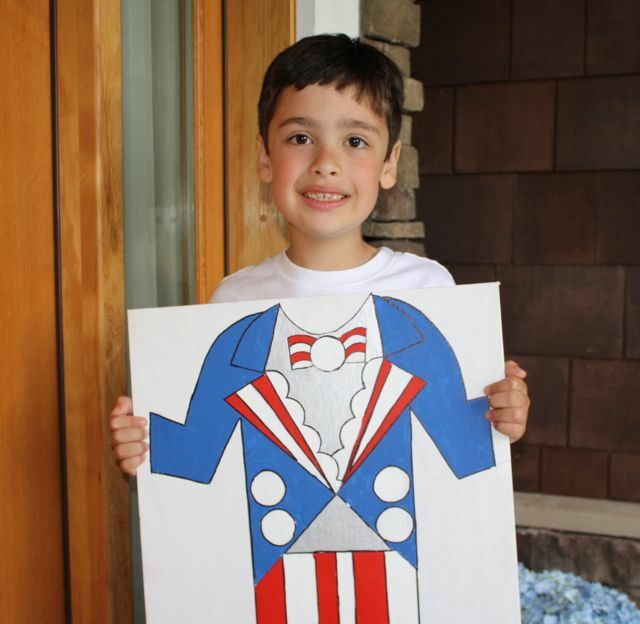 This is a fun project and once you make it, you can use it for every Fourth of July to come! 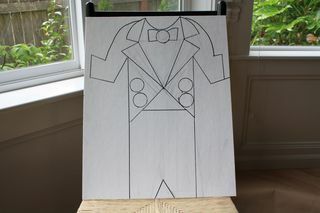 Step 2: Sketch Out a "Costume" on your canvas. 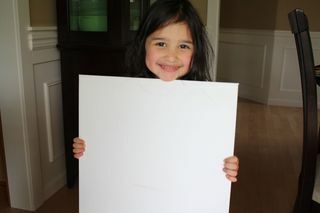 I had my little girl hold it up to her so I could determine where to draw the clothing and where her hands would go. Step 4: Add Detail. I used a ruler to help me get my lines straight. I also traced around the bottom of a paint bottle to make circles. 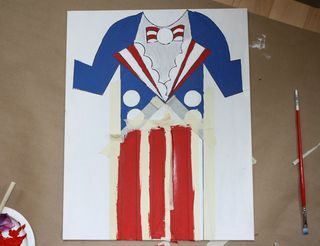 Step 5: Paint your project. 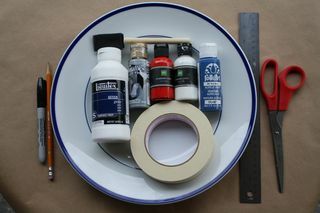 The masking tape can help keep the lines straight. It won't damage any areas you've already painted. 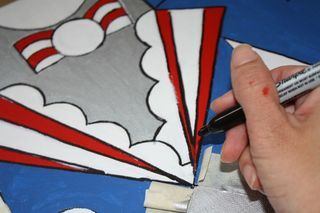 Step 6: The paint dries pretty quickly so you can work on different sections and the same time. Step 7: Go over your lines again with the Sharpie. Step 8: Take Some cute pictures! What a cute idea! So unique! Would love you to stop by Thursday & link it up to Fab Finds for the 4th! That is such a cute idea and the kids are so adorable. 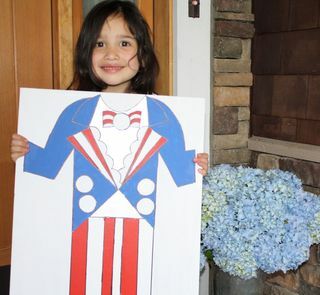 What a fun and fabulous idea for the 4 th! So clever. 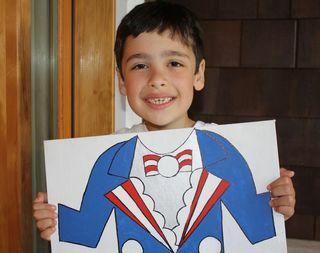 What a fun and fabulous idea for the 4th! So clever. That is so fun!!! I love it! Oh my goodness. This makes me smile! What fun!! This is such a wonderful idea that could certainly by used for any holiday! The possibilities are all popping into my head! So great to have you on Craft Schooling Sunday and I hope you’ll become a regular. All the best! That looks so cute. What a fun idea for the kiddo’s to help with too!! This is such a FUN idea!! A fun addition to any patriotic party!! Thanks for sharing! This is too cute!! Great job! 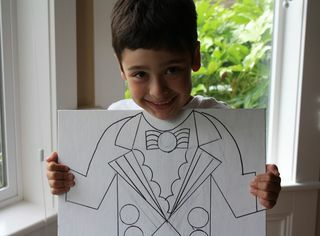 Love that idea – so clever and fun! Could I make ones for my pets? – doubt they would be as enthusiastic as me…. Totally fun idea that I immediately made it! Can’t wait to bring it to the holiday bbq! I’m sure all the parents will enjoy taking pics with their kids and this prop. Thank you! This is great! I’d like to see Neal modeling this! this is the cutest thing ever! I agree that Neal needs to model! 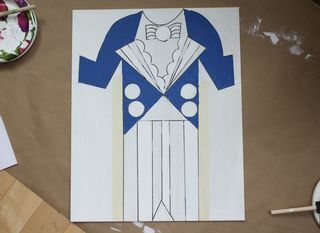 :) can you make a really tall one for erik?